I have yet to meet someone who doesn’t like banana nut bread. Personally, I’m absolutely nutty about it! This delicious snack is perfect for breakfast, dessert, kids lunch boxes, or daytime snacks! If you haven’t tried a slice with some peanut butter and hot chocolate, you haven’t lived. 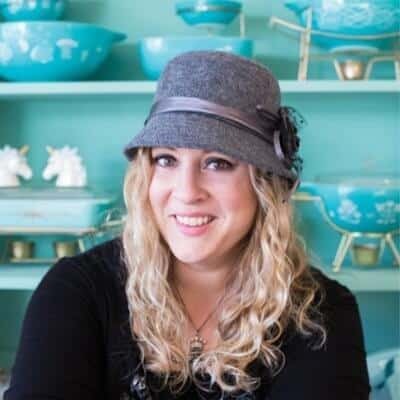 I like to make my banana nut bread with any bananas I have lying around that are starting to brown, but it’s not absolutely essential that they’re overripe. As long as they have a good yellow colour, you can buy some new in the store and use them instead! 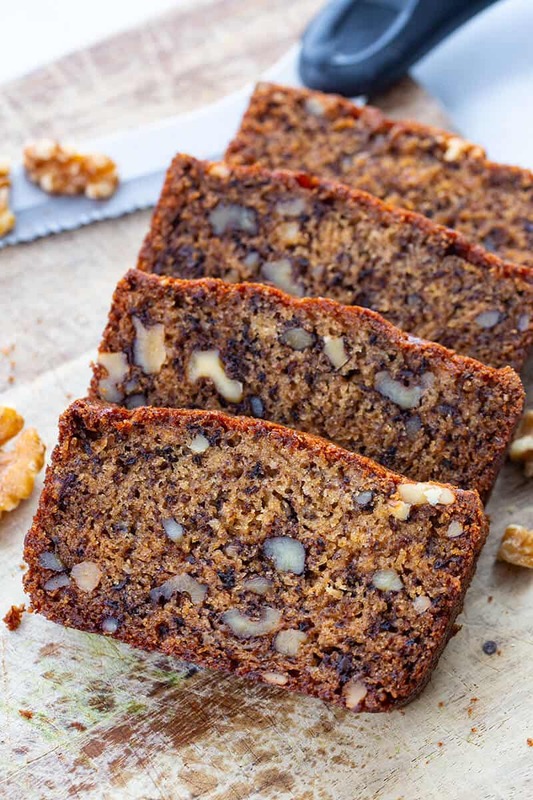 This banana nut bread recipe is soft, moist, and SUPER easy to make. It’s seriously addictive too, I find it so hard to pass by it without having a nibble! Whisk together the flour, salt and baking soda in a bowl. Cool the loaf in the pan for 10 minutes, then remove from the pan and let cool completely on a wire baking rack. How do you know when Banana Nut Bread is done? Test your banana nut bread for doneness about 10 minutes before you expect it to be ready. You can do this by inserting a cake tester (or even a toothpick) near the middle of the loaf. You’ll know the center of the loaf is done if the tester comes out clean. 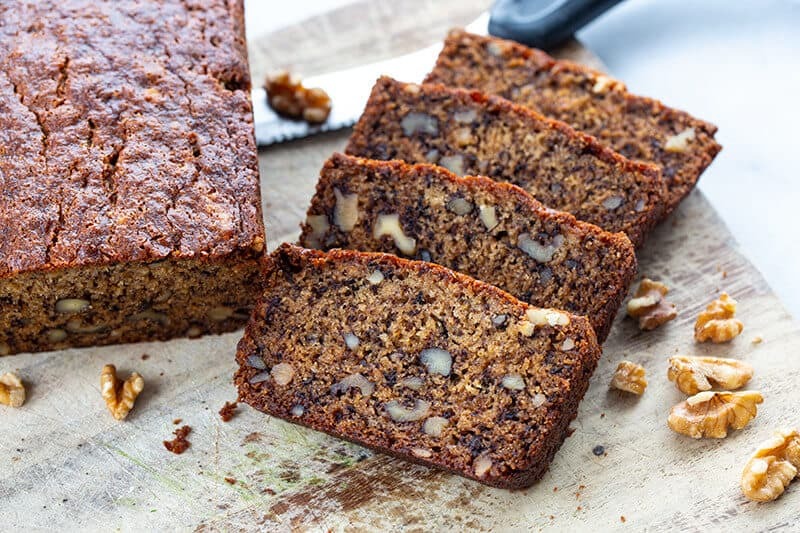 If your banana nut bread keeps coming out a bit dry, try using oil instead of butter. The oil emulsifies and coats the flour which stops it from absorbing too much water and drying out the bread! Your bread is more likely to be a bit dry if your bananas aren’t very mushy, so keep that in mind beforehand and swap in some oil if needed. Also make sure that you wrap your banana bread in plastic wrap when it’s still a bit warm so that it doesn’t dry out overnight. What’s the difference between Banana Bread and Banana Cake? These two taste pretty similar but there are a few differences in the recipe that make banana cake a little sweeter. Generally, banana bread will have more of a bread-like grain taste, whereas banana cake is lighter and will taste more like a sweet dessert. Long story short – yes! Bananas are incredibly healthy; they help to reduce sugar cravings, improve digestion, reduce stroke risk, provide energy, help our bodies to fight infections, and lots more! And when you add walnuts to the mix, the nutritional value of this easy to make snack goes through the roof. Walnuts are super rich in antioxidants (more than any other type of nut!) and they support good brain function and healthy aging. Plus, they’re really really yummy – which matters a lot too! I hope you love this awesome banana bread recipe as much as I do! And remember, you can also swap out the walnuts for any nut you prefer! Happy baking! Butterscotch Oatmeal Banana Bread: a mouth-watering variation on traditional banana bread! Chocolate Chip Banana Muffins: a great sweet treat for everyone in the family. Blueberry Banana Bread: the blueberries give a delicious twist to my favourite everyday bread loaf. Banana Nut Bread is a thicker, denser yet still delicious and moist banana loaf that is loaded up with walnuts or nuts of your choice. 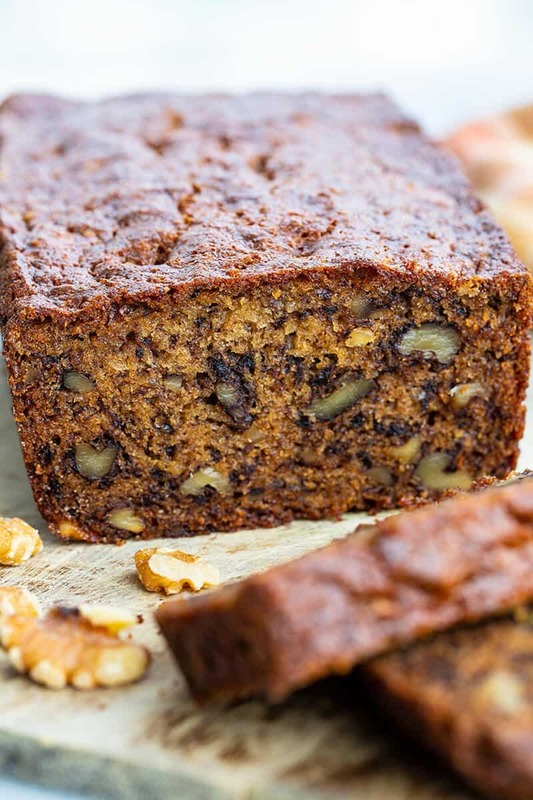 There is no baking powder in this recipe on purpose : banana nut breads are supposed to be thick, dense and moist, not light and airy!